What is the difference between Cloud and Desktop subscription? With the desktop subscription, we provide the complete platform to be installed on your personal desktop. All the database access and social connections happen via your desktop. What is the difference between Desktop and Server license? The desktop license allows one desktop user to create data visualizations and dashboard on the personal computer. You can create PDF and image exports of the dashboards for sharing purpose. It is not possible to share the dashboards to the intranet or internet. Server license can be installed on a windows,linux, Mac OS. It can be installed on any computer or server. Server license allows publishing to the internet or intranet. Server Basic provides Single user login account with unlimited dashboard publishing. Server Basic license provides one admin account. These dashboards can be embedded on any portal including sharepoint or directly on the website. Server Unlimited provides unlimited logins with unlimited dashboard publishing. These dashboards can be embedded on any portal including sharepoint or directly on the website. This is a good option for SAAS based dashboard reporting. It is also recommended for OEM Dashboards. What kind of data I can work with? Using JDBC or ODBC, you have plenty of options to connect other databases. All connections are live and real time. There is no data extraction job needed. We are constantly adding new connectors every month. A connection is an authenticated handle that you define with the web service or database. Each Google Analytics profile uses 1 connection count. Each Salesforce account is one connection. 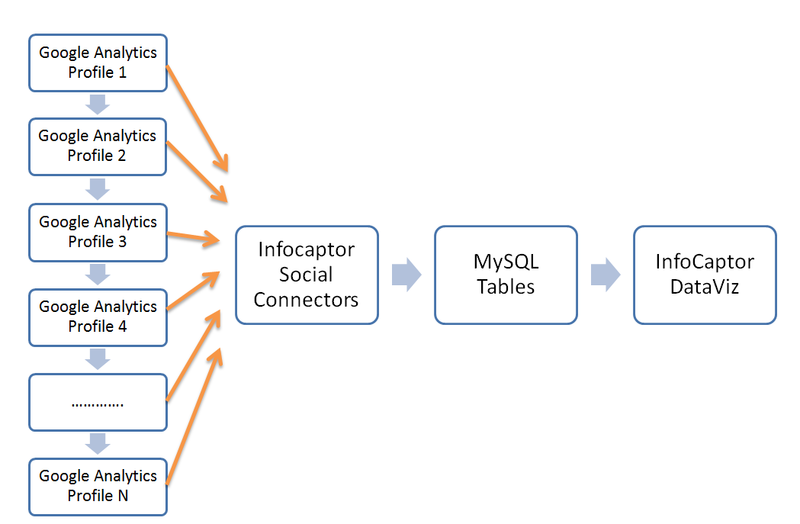 Each database connection for e.g say MySQL DB is one connection. Your subscription plan will determine how many such connection handles you can define. A job is a data extraction defintion that you define against a connection handle. Job is applicable only to social connectors. All database connectors are live connections so they don't need any data extractions. For e.g in case of Google Analytics, you may define one job to extract visitors, bounce rates and organic search metrics. You may define a second job that extracts Adwords cost, Referrals and Keywords and so on. Where does my extracted data go? Remember, with the desktop subscription, all your data stays on your computer. Once you define an extraction job, the job is run on a daily basis or based on your frequency and subscription plan. 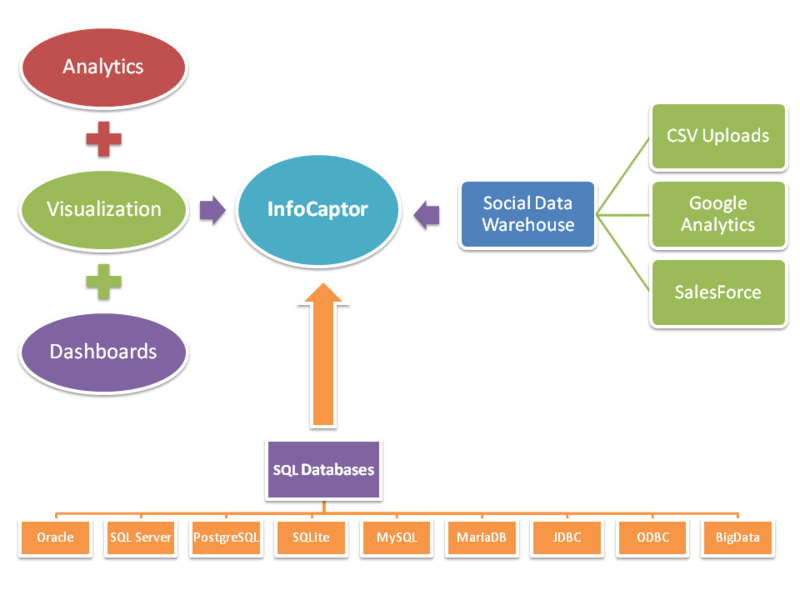 You have read access to this schema within the visualizer and Dashboard editor. The complete table listing for all your jobs is also visible. Yes this is a monthly or annual subscription. It will automatically renew and assume that you are using it. When you cancel, the subscription will not renew at the next monthly cycle. Can I add more users to my Desktop plan? The desktop plan is a personal one user plan. No additional users can be added to the system. For more than one user, you need to purchase and install Server based license. Are you struggling with keeping up with your website traffic data? Do you think automation is important for your business to grow faster? Save hundreds of hours with all of your weekly and monthly reports and streamline all your reporting. Once setup, your data and dashboards will keep refreshing while you sleep!